Putting the roof on the grubenhaus is a more involved job than shaping the building. The main thing is that you will only get one go at the process: if it goes wrong, there is no way (as far as I know) of proceeding except to throw the whole thing away and start again. Whilst the components are cheap, getting to this stage has involved some investment of time, so I prefer to go carefully. The roof components are shown here. The grubenhaus, with the purlins in place, a piece of fur fabric considerably larger than the house, and impact cement. If you feel that the fur fabric is not going to represent the depth of a thatched roof sufficiently, at this stage add an "under-roof" of foamboard or thick card, then proceed as below. 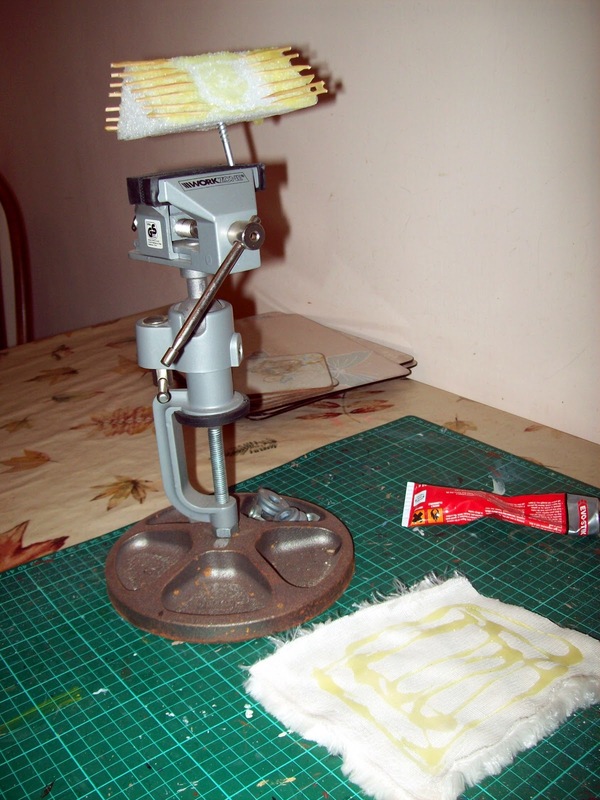 Apply plenty of glue to the grubenhaus roof and purlins, and a good layer to the back of the fabric. I've found that a largish sized woodscrew forced into the foam gives a decent handle, with plenty of purchase. And you definitely need it! Impact cement has a habit of getting all over everything, dripping and oozing, and the least little bit on your finger will stick to something awkward at the most inopportune moment. The vice helps to keep things under control. Once the impact cement has gone from wet to tacky (almost dry to the touch), fit the roof to the fabric. It's much simpler to do it that way around than to try to drape the fabric onto the roof. Place the roof down onto the glued area firmly. Once it's pressed down, the chances of you getting it apart in such a way as to have a second attempt are about nil, so go carefully! 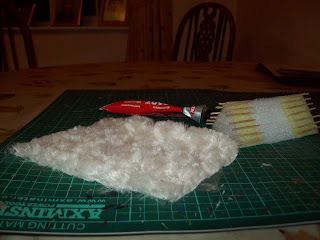 ﻿Now simply roll the roof over onto the other glued section of fur, and there you go, a thatch! Albeit a pretty wild, out of control one. Next step is to dress up the ends, to cover up the foaminess. Very clever!! I like it! !